You may not believe this, but overall, I like “agile” management and coding practices- where they fit. 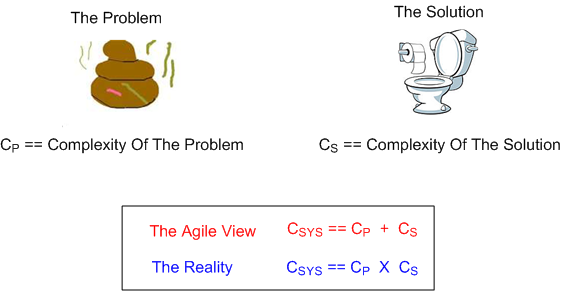 The most glaring shortcoming that I, and perhaps only I, perceive in the “agile” body of knowledge concerns the dearth of guidance for handling both the social and technical dependencies present in every software development endeavor. The larger the project (or whatever you #noprojects community members want to call it), the more tangled the inter-dependencies. There are, simultaneously: social couplings, technical couplings, and the nastiest type of coupling of all: socio-technical couplings. 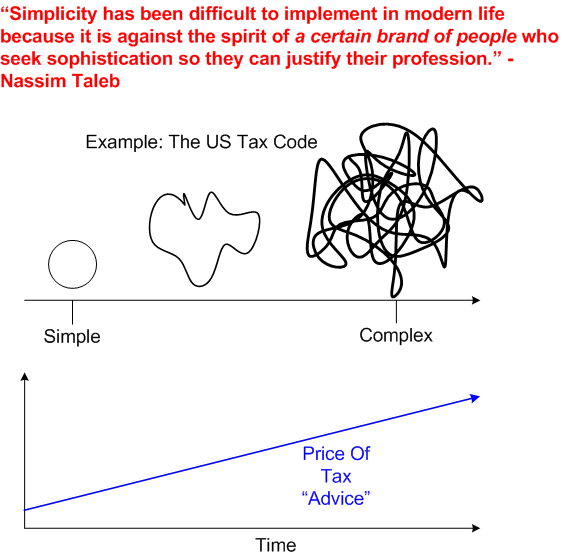 The complexity of the system is at least equal to the product of the problem and solution complexities. At worst, there are exponents associated with one or both multiplicands. Since four out of five reviewers gave it 5 stars, I scrolled down to peruse the reviews. As soon as I read the following JAMB review, I knew exactly what the reviewer was talking about. I can’t even begin to count how many boring, disappointing management books I’ve read over the years that fit the description. What I do know is that I don’t want to spend any more money or time on gobbledygook like this. 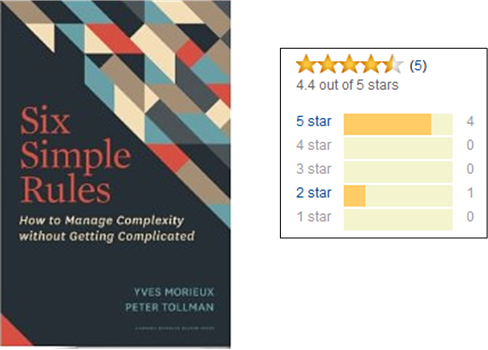 While browsing around on Amazon.com for more books to read on simplicity/complexity, the pleasant memory of reading Dan Ward’s terrific little book, “The Simplicity Cycle“, somehow popped into my head. Since it has been 10 years since I read it, I decided to dig it up and re-read it. In his little gem, Dan explores the relationships between complexity, goodness, and time. He starts out by showing this little graph, and then he spends the rest of the book eloquently explaining movements through the complexity-goodness space. Complexity: Consisting of interconnected parts. Lots of interconnected parts equal high degree of complexity. Few interconnected parts equal a low degree of complexity. 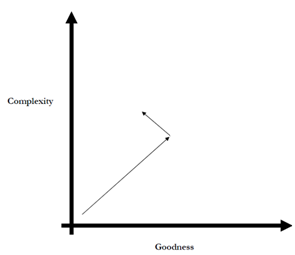 Goodness: Operational functionality or utility or understandability or design maturity or beauty. When we start designing a system, we have no parts, no complexity (save for that in our heads), no goodness. Thus, we begin our effort close to the origin in the complexity-goodness space. As we iteratively design/build our system, we conceive of parts and we connect them together, adding more parts as we continuously discover, learn, employ our knowledge of, and apply our design expertise to the problem at hand. 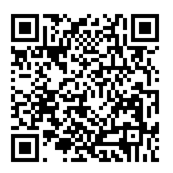 Thus, we start moving out from the origin, increasing the complexity and (hopefully!) goodness of our baby as we go. The skills we apply at this stage of development are “learning and genesis“. Many designers, perhaps most, don’t realize they’ve rotated the vector to the left. 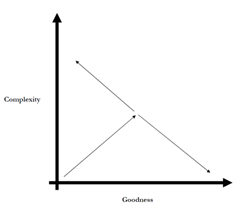 We continue adding complexity without realizing we’re decreasing goodness. Once we hit the invisible but surely present wall, the only way to further increase goodness is to somehow start reducing complexity. We can do this by putting our “learning and genesis” skills on the shelf and switching over to our vastly underutilized “unlearning and synthesis” skills. Instead of creating and adding new parts, we need to reduce the part count by integrating some of the parts and discarding others that aren’t pulling their weight. Dan’s explanation of the complexity-goodness dynamic is consistent with Joseph Tainter’s account in “The Collapse Of Complex Societies“. Mr. Tainter’s thesis is that as societies grow, they prosper by investing in, and adding layer upon layer, of complexity to the system. However, there is an often unseen downside at work during the process. Over time, the Return On Investment (ROI) in complexity starts to decrease in accordance with the law of diminishing returns. Eventually, further investment depletes the treasury while injecting more and more complexity into the system without adding commensurate “goodness“. The society becomes vulnerable to a “black swan” event, and when the swan paddles onto the scene, there are not enough resources left to recover from the calamity. It’s collapse city. 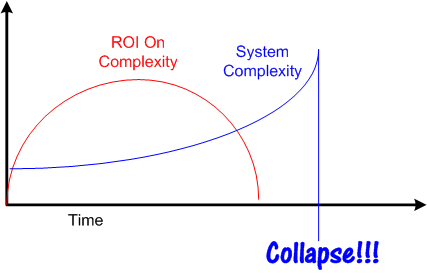 The only way out of the runaway increasing complexity dilemma is for the system’s stewards to conscientiously start reducing the tangled mess of complexity: integrating overlapping parts, fusing tightly coupled structures, and removing useless or no-longer-useful elements. However, since the biggest benefactors of increasing complexity are the stewards of the system themselves, the likelihood of an intervention taking place before a black swan’s arrival on the scene is low. At the end of his book, Mr. Ward presents a few patterns of activity in the complexity-goodness space, two of which align with Mr. Tainter’s theory. 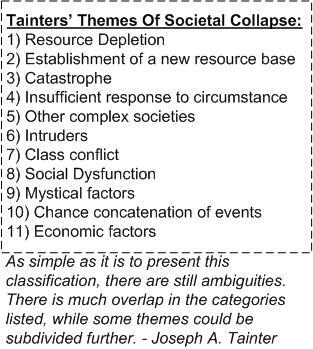 Perhaps the one on the left should be renamed “Collapse“? So, what does all this made up BD00 complexity-goodness-collapse crap mean to me in my little world (and perhaps you)? In my work as a software developer, when my intuition starts whispering in my ear that my architecture/sub-designs/code are starting to exceed my capacity to understand the product, I fight the urge to ignore it. I listen to that voice and do my best to suppress the mighty, culturally inculcated urge to over-learn, over-create, and over-complexify. I grudgingly bench my “learning and genesis” skills and put my “unlearning and synthesis” skills in the game. Complexity is generally understood to refer to such things as the size of a society, the number and distinctiveness of its parts, the variety of specialized social roles that it incorporates, the number of distinct social personalities present, and the variety of mechanisms for organizing these into a coherent, functioning whole. – Joseph Tainter. His theory goes something like this. As a society grows, it necessarily becomes more complex. Exceedingly more and more investment in complexity (infrastructure, basic services, defense, food production control, public tributes to the elite to maintain their legitimacy in the minds of the non-elites) is then required to hold the society together. 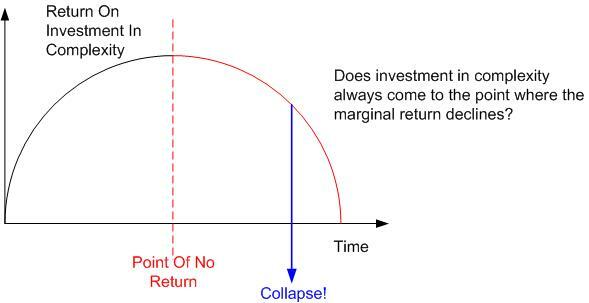 However, as the graphic below shows, at some point in time, the marginal return on the investments in complexity reaches a tipping point at which the society becomes vulnerable to collapse from one or more of the subsumed themes. As shown, societal growth begets a larger and more internally diverse production subsystem. That same growth requires investment in more and varied control (Ashby’s law of requisite variety) over production so that “the center can hold” and the society can “retain its identity as a whole“. In this runaway positive feedback system, the growing army of controller layers siphons off more and more of the production outputs for itself – starving the production subsystem in the process. To prevent the production subsystem from dispersing (or revolting) and keep the whole system growing, more and more investment is poured into production control (compliance and efficiency) in an attempt to increase output and keep both the production and control subsystems viable. 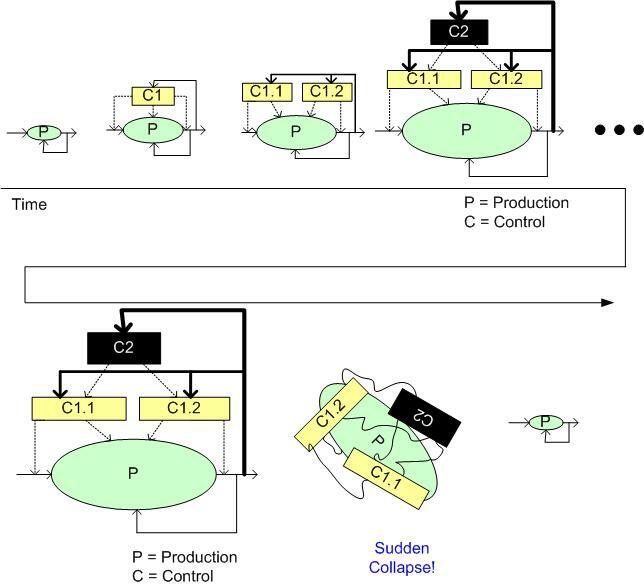 However, as the control subsystem growth outpaces production subsystem growth and a caste system emerges, the control subsystem requires a larger and larger share of the production subsystem outputs for itself – which further weakens and constrains and alienates the production subsystem. Hence, the “declining marginal return on investment in complexity” machine is kicked into overdrive and the vulnerability to collapse appears on the horizon. D’oh! In your growing “society“, is the controller subsystem growing faster than the production subsystem? Are more specialized controller/administration layers being added faster than producers? Is the caste system becoming more stratified and prejudiced? Are more and more processes/rules/policies being imposed on the production subsystem for increased compliance and efficiency? Is the army of growing controllers siphoning off more and more of the production system outputs for themselves? If so, then maybe your society is vulnerable to sudden collapse. But then again, it may not. Tainter’s thesis is simply a bland and drama-less, economically based theory. It might be tainted itself. The Gall Of That Man! We can add the Strategic Defense Initiative (Star Wars), the FBI’s Virtual Case File System (VCS), JTRS, FCS, and prolly a boatload of other high falutin’ defense projects to the list of wreckage triggered by violations of Gall’s law. Do you have any other majestic violations you’d like to share? Can you cite any counter-examples that attempt to refute the law…. C++, which started out simply as “C With Classes“, is a successful complex “system“. Java, which started out as a simple and pure object-oriented system, has evolved into a successful complex system that now includes a mix of functional and generic programming features. Linux, which started out as a simple college operating system project, has evolved into a monstrously successful complex system. DDS, which started out as a convergence of two similar, field-tested, pub-sub messaging implementations from Thales Inc. and RTI Inc., has evolved into a successful complex system (in spite of being backed by the OMG). Do you have any other law abiding citizens you’d like to share? 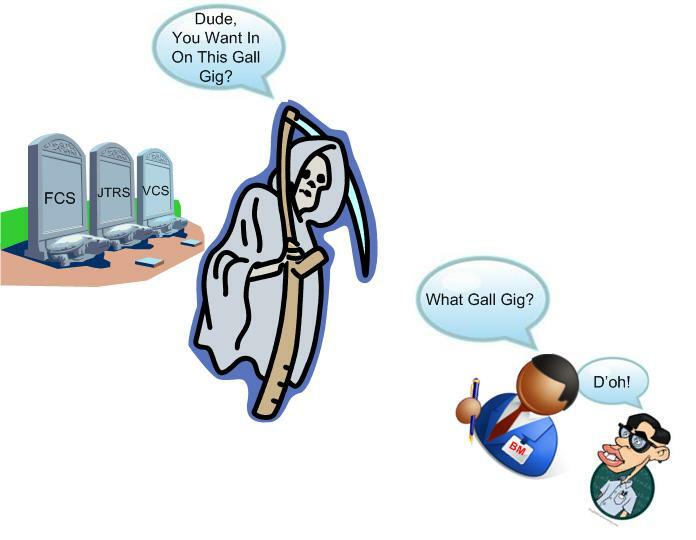 Gall’s law sounds like a, or thee, platform for Fred Brooks‘ “plan to throw one away” admonition and Grady Booch‘s “evolution through a series of stable intermediate forms” advice. Here are two questions to ponder: Is your org in the process of trying to define/develop a grand system design from scratch? Scanning your project portfolio, can you definitively know if you’re about to, or currently are, attempting a frontal assault on Gall’s galling law – and would it matter if you did know?